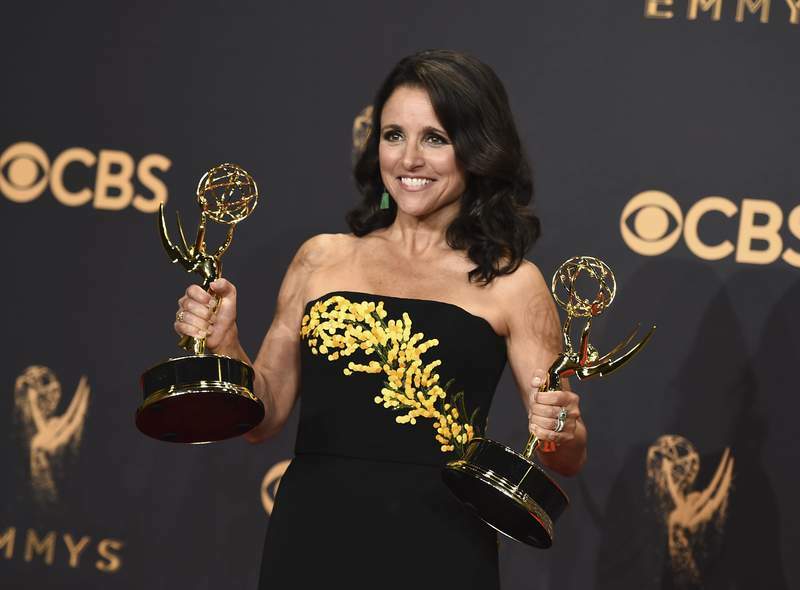 NEW YORK – Julia Louis-Dreyfus is back at work on "Veep" and said it feels "fantastic." As work began recently on the show's seventh and final season, Louis-Dreyfus told The Associated Press: "I feel good. I feel strong. I've got energy and, yeah, back to my old tricks. It feels like I never left." The "Seinfeld" alum has signed on to her first cancer awareness initiative, helping Carolina Herrera designer Wes Gordon design a flower-adorned T-shirt as part of Saks Fifth Avenue's 20th year raising money through its Key to the Cure program. "Up to 70 percent of breast cancer survivors who have had a mastectomy are really unsure or unaware of their reconstruction options, and many of those women who desire to have surgery don't have sufficient insurance or other resources to cover it," Louis-Dreyfus said by phone on a recent location day for "Veep." As a survivor, she said she's often asked to help out. This is the first time she has said yes. "It's hard to say no but I've just had to be very careful about managing my time and conserving my energy, so you know I'm putting my whole self into Key to the Cure," Louis-Dreyfus said. "You can't spread yourself too thin. That's why I wanted to choose the organization wisely and carefully." As this year's ambassador for the program, Louis-Dreyfus said she wanted a bold statement for the annual T-shirt. It features three poppies and the slogan: "We are fighters & we are fighting for a cure." "It was a super-fun endeavor," Louis-Dreyfus said of the T-shirt design process. She has often worn Herrera designs on red carpets. The shirt features blooms in jewel-tone red and pink. "I wanted it to have a sort of femininity and a powerful message at the same time because I believe the two can go hand in hand," she said. "I liked the idea of talking about fighting."